ASCLS offers a variety of membership categories ranging from Student to Professional 1. 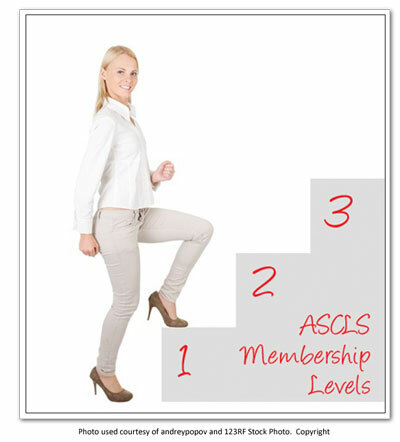 This allows you to keep your ASCLS membership in step with your changing career. New this year, ASCLS is offering a Certification Maintenance Membership which offers you 12 hours of P.A.C.E.®-approved online continuing education towards your recertification. This special offer is available ONLY to ASCLS members. If you are interested in updating your membership type, you must contact the ASCLS offices to request the change. Student memberships will automatically be updated to First Year Professional upon renewal of their membership. So go ahead…take the next step and join ASCLS! Includes basic benefits. Designed for members who have retired or those choosing not to receive the journal. ASCLS can help with your recertification needs. Purchase a Certification Maintenance Membership now. Available to any individual who currently holds membership in any other health related national organization and has never been a member of ASCLS. This category does not have voting privileges and cannot hold a leadership position. Open to persons who have graduated within the last 12 months from an accredited program in laboratory science. Prior student membership with ASCLS is not a prerequisite. This membership status is valid for only one year to assist recent graduates. After one year in this category, members are upgraded to Professional membership. Open to persons enrolled in a structured program of training or academic instruction in clinical laboratory science, or to full-time graduate students in a related science area. ASCLS just made your life easier! ASCLS is rolling out new membership packages created for employer groups within the scientific community (groups of 10+ members) and educational institutions. FREE registration(s) to an ASCLS national meeting – the Annual Meeting and Clinical Lab Expo, Legislative Symposium or the Clinical Laboratory Educators’ Conference (CLEC) – to use as you wish (number of FREE registrations varies by number of members in the package). A reduced Student and/or Professional 1 membership rate(s).